Experimental and painterly, Modern in aesthetic and traditional in theme, Elena Zolotnitsky's portraits and still lifes visualize an imaginative creative process. "Painting for me is about seduction and mystery," says Russian-American artist Elena Zolotnitsky (b. 1961). "It is a magic act, when the combination of oil paint, a bit of imagination and a lot of heart create something alive and vibrant that other people can relate to on an emotional level." Zolotnitsky (b. 1961) was born and raised in Moscow, and her Russian roots have imparted a lasting influence on her work - not least because the artist's father was a longtime freelance illustrator and creative art director in film. Elena herself graduated from the Moscow Cinema Academy in 1986 with a Master's in Fine Art and Animation. Since 1993, she has been exhibiting fine art widely in the States. She currently resides in Northern California, just outside of San Francisco. Bust-length portraits and floral still lifes compose much of Zolotnitsky's production. For the artist, these timeless subjects allow her freedom to explore formal relationships within each composition, unrestrained by the need to construct a narrative, while simultaneously pointing to history and another of her important influences: Flemish art. The interaction of shapes and hues left by the artist's brush forms the true subject of the paintings, in which some passages are defined by distinct, swooping marks and others are blocked in with large patches of bold color. For Zolotnitsky, building a painting is a performance like stepping onto a stage, one that requires immediacy and flexibility. "I love challenges," says the artist. "For me, starting a painting always feels like jumping off the cliff into the cold ocean. You have to stay present, completely in the moment, giving all you've got to that white rectangular surface ... I am simply addicted." This month Zolotnitsky is exhibiting her latest work in a two-person show at Atlanta's Pryor Fine Art, alongside abstract painter Steven Seinberg. All of the paintings featured in this article are on display in the exhibition, which hangs through the end of May. Zolotnitsky's accomplishments include grants from the Helene Wurlitzer Foundation and the Paul Beckett Foundation, and award recognitions from the Mid-Atlantic Watercolor Exhibition and the New York Society of Illustrators' annual exhibition. Her work has been featured in solo exhibitions at Paul Mahder Gallery (2009) and Franklin Bowles Gallery (2006) in San Francisco, and at B. Boeltz Gallery (2006) in Denver. The artist has also shown in group exhibitions at Pryor Fine Art (2012, 2011), San Francisco's Gallery Paule Anglim (2008), the SFMOMA Artists Gallery (2006), and elsewhere. >> Visit Pryor Fine Art online to see more of her work. 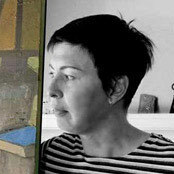 People: Elena Zolotnitsky, Steven SeinbergVisit Pryor Fine Art online to see more of her work.